A Superb Pair of Armorial Plates. 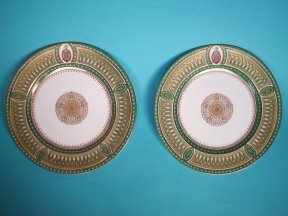 A pair of superbly decorated English Bone China Armorial plates, 26cm. diameter. Decorated with an intricate design with raised paste gilding, enamel jewelling and a Coat of Arms with motto 'Constantia Et Labore' to the rim. The plates have no makers mark. I am currently researching the Arms. Very good. No damage and only a very small amount of wear to the enamels and gilding. A pretty Caughley soft paste porcelain Asparagus server. Dating from c.1780-90. 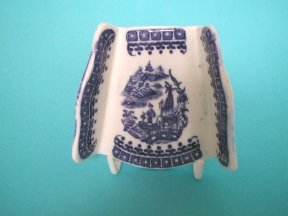 Decorated in printed underglaze blue with elements of the 'Fisherman' pattern. Measures 7.5cm. long. Good, no damage. A small imperfection to the glaze on the edge of the rim, where it touched another item during firing. English Cabinet Plate. c.1870. View of Conwy North Wales. A nicely painted cabinet plate, probably made at the Minton factory c.1870. 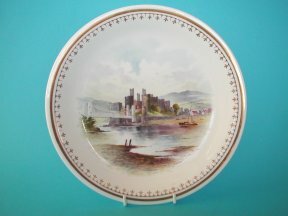 The view, signed by the artist A.Walker, is of Conwy Castle North Wales. The final picture is of the same view today ( early February 2004 ) The late 19th. / early 20th. Century road bridge spoils the view somewhat! The plate measures 22cm. diameter and has no makers marks. An miniture teabowl c.1790. 3.3cm high and 5cm dia. 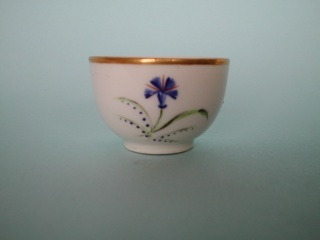 Decorated in french style with an enameled cornflower pattern. Almost certainly made at the Derby factory. A couple of items in the Bernard Watney collection were decorated with very similar sprigs and were identified as Derby.